1. In life there are no do-overs. But there are in knitting. All the time! I started over on this Evenstar shawl five freaking times. And every few rows I find something that requires me to tink back a bit. I do this more with lace than with any other type of knitting. Is lace somehow the antithesis of life? My Evenstar. Oh so many stitches to go. 2. Never tell your problems to anyone…20% don’t care and the other 80% are glad you have them. The person who said this never tried to bring their dropped stitches or messed up cables to my knitting group. Always bring your knitting problems to knitting group…20% can help you fix them and the other 80% are glad you asked because they have the same problem. 3. Enjoy your own life without comparing with that of another. I derive great enjoyment comparing and sharing my knitting with others. 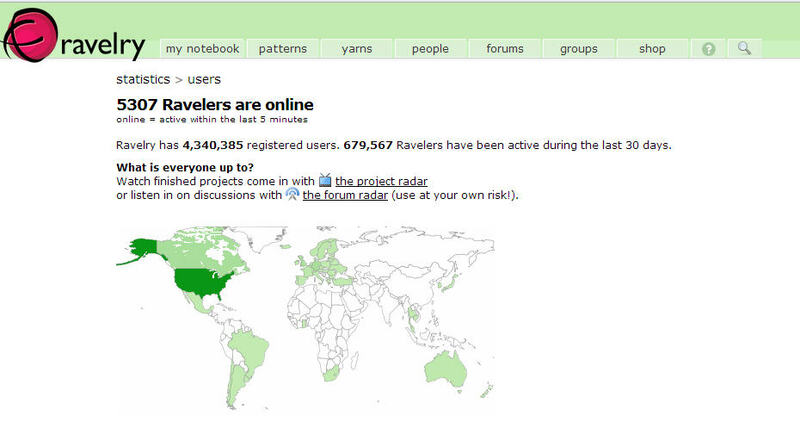 4 million+ other Ravelry users agree. 4. Life shrinks or expands in proportion to one’s courage. I find that my knitting shrinks or expands in unpredictable ways. Because gauge swatches lie! It’s got nothing to do with courage and everything to do with the gremlins who come out at night and stretch my sweater arms out of shape. 5. Life is wasted on the living. Try inserting “knitting” in place of “life” and you get a very creepy statement. All I can think of is my lovely knitting projects getting buried underground and full of rot and maggots. Yech! When I die, pass my sweaters out to living people who can still appreciate them. Vampires don’t count (they don’t get cold). Happy knitting, everyone. Remember not to take life/your knitting too seriously. That’s one truism I’ll keep. It is well said and have to share this! I love these! And I linked to this post in my next Saturday links. Thanks. Did you ever receive the shawl, btw? I thought I was the only one who felt gauge swatches lied! I made this absolutely beautiful sweater last year that took 3 months to make – and I couldn’t wear. I ended up felting it by running it through the washer and dryer several times. Now, it just looks weird! You’re not alone. One solution, of course, is to knit larger gauge swatches. But one only has so much time. And with some fibers, even a larger gauge swatch might not tell you how a garment will behave at full size and weight. Some fibers like to stretch. Sorry about your sweater. We all have a few like that. This is a great post. Wise observations of how we knitters roll. I feel like we need some knitterly slang here. Can’t think of any though. I would have been lost if knitters weren’t so friendly and happy to help and offer solutions. You’re all awesome and constantly inspire me with your work. That’s really sweet. I love the comradeship of my fellow knitters too. I always know there’s someone I can go to if I’m confused. Love this post! Could not agree more with your thinking. Have a great rest of the week. Let me know if you think of any more to add to the list. All these are very true but #2 is my favorite. As someone who has never been part of a knitting group I can say that’s what Ravelry is for as well. That’s true. I haven’t made extensive use of the forums for trouble shooting, but I know a lot of other people do. If I ever decide to take up Estonian lace I might need to reach out on the forums. I hear that some of the patterns can be a little hard to interpret. Starts my day with a smile! or more like a chuckle. Perfect! What a clever idea for a post! And you’re right, gauge swatches lie. The jerks. So long as they don’t form a union and go on strike, my knitting will probably survive.